Just came across a delightful CD — Multiplication Mountain which includes some wonderful musical patterns such as Waltzing Through The Threes! Music, rhythm and rhyme make learning fun. The words and music are by Hap Palmer. It’s foot-stompin’ fun! The CD can be found on www.happalmer.com. 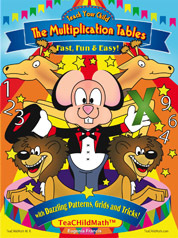 *Fun Activities for Learning the Times Tables! Because children who have ADHD are active learners incorporate math drills into activities. For example, create a scavenger hunt where each clue comes with a multiplication drill or play an outdoor game such as red light/green light and have the children calculate basic math facts. It is also important to break up the math review into shorter lessons 15-20 minutes of review but with more frequency. If students can spend 15 minutes playing a multiplication game every day of the week then they will be better able to grasp the material. Posted in Teach/teaching your child the multiplication tables. | Comments Off on *Fun Activities for Learning the Times Tables!